Students returning to classes this week will find construction projects poised on both ends of main campus, as the facilities of NMC’s future learners move from paper to reality. NMC broke ground on a new student residence hall and fitness center July 11. 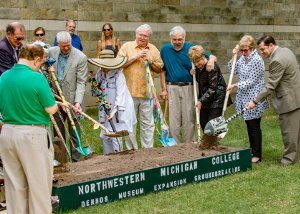 That was followed by an Aug. 15 groundbreaking for an expansion of the Dennos Museum Center. Both projects will update aging campus infrastructure and allow the college to meet the needs and expectations of twenty-first century students. Located on the north side of East Hall, the residence hall will accommodate 140 students beginning in the fall 2017 semester. Current student housing at NMC has been at capacity for three years, and existing housing is more than 40 years old. NMC is self-funding the $8.8-million project. Located on the southeast side of the existing museum, the project includes two new permanent collection galleries, a new sculpture gallery, a larger Inuit art gallery, additional classroom space and storage and loading dock improvements. Built in 1991, the expansion is targeted for completion in 2017, capping the Museum’s 25th anniversary year. The $5 million project was spearheaded by major gifts from Richard and Diana Milock and Dudley and Barbara Smith. Also on the drawing board in 2017 is NMC’s renovation of West Hall into a student innovation center. Using a state planning grant, the college will move into design phase, conducting interview with designers and architects next year, and returning to the state for construction authorization by October 2018. As envisioned, the project would almost double the size of West Hall, from 20,000 to 38,000 square feet. It would provide for 13 adaptive, technology-rich learning spaces to be used across the curriculum for simulation, team-based and project learning. Nelson noted the support of local legislators Representative Larry Inman (R-Traverse City), Senator Wayne Schmidt (R-Traverse City) and Senator Darwin Booher (R-Evart) has been integral to the project’s progress.